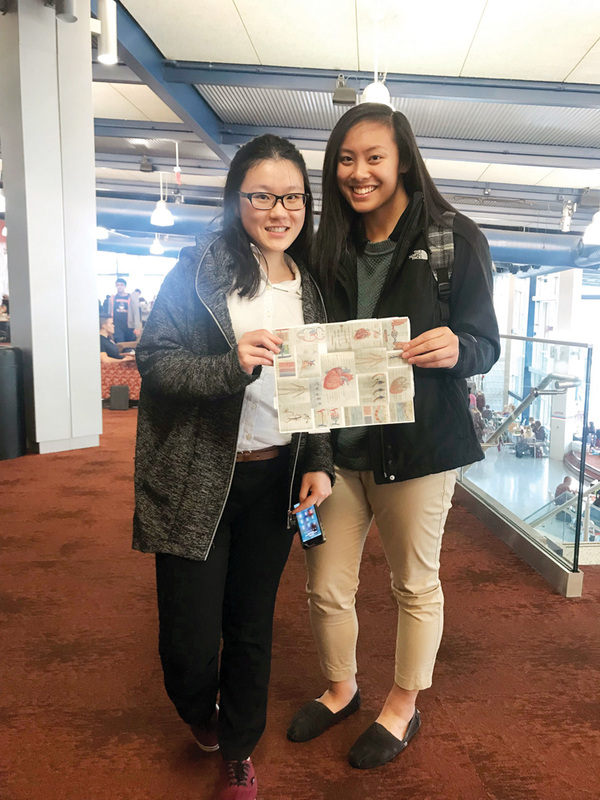 DCHS students Alice Xu and Abby Agapito display the 120-numbered Anatomy & Physiology test that they completed with time to spare, and in which they placed 11th in the state and first in Sussex County in the 2019 Science Olympiad. On Saturday, March 2, Delmarva Christian High School students Abby Agapito, Jessie Sun, Alice Xu and Jasmine Zhang participated in the 2019 Science Olympiad competition held at Delaware State College in Dover. With 56 teams across Delaware competing, seniors Agapito and Xu placed ninth in the Anatomy & Physiology Test Taking event — the highest score of all the Sussex County schools. Also winning was Sun, taking 11th place (of approximately 32 teams) in the Wright Stuff event, where she had to build a monoplane, and teammates Sun and Zhang placing 22nd (of approximately 50 teams) in the Write It, Do It competition, in which Sun was required to write a description of a model and Zhang had to build a model based on Sun’s description.